I often wonder how this blog might have been different if I had started writing it before I became a parent. Very likely my poor readers, if there had been any readers at all, would have endured many more posts on literary theory and many fewer posts on children’s literature. This is not to say that I was not interested in children’s literature before I became a parent. I have always loved stories and storytelling, fairytales and fantasies, illustrations and drawings. I have also taught classes on the subject, even before I had children. The difference now, it seems, is that most of my time is snatched here and there between the duties of parenthood, so I have few of the lengthy stretches of continuous time that I need to read theory, but I have many of the short bits of time when my kids would like me to read to them anyway, and so I find myself reading so many children’s stories that I almost have to find something interesting every once in a while, even considering how poor most writing for children generally is. This past week, I happened to pick up The Moon’s Revenge, a fairytale written by Joan Aiken and illustrated by Alan Lee, mostly because I liked the cover illustration, and because, all painfully cliche adages aside, it is often possible, in fact, to know a good deal about a book from its cover. To be fair, I also recognized the names of both the author and the illustrator, so my bets were well hedged, and they were not at all disappointed. Joan Aiken has written many novels, shorter tales, and picture books in a wide range of styles for almost all ages. Her best known work is probably The Wolves of Willoughby Chase, which is a series of twelve fantastical and quasi-historical novels, but she is also known for her Armitage Family Stories, and some of her short fantasy tales are very good as well. I have not read any of her longer books, I will admit, but I have enjoyed her children’s books, and I suspect that I will be exposed to her novels more as my children grow. 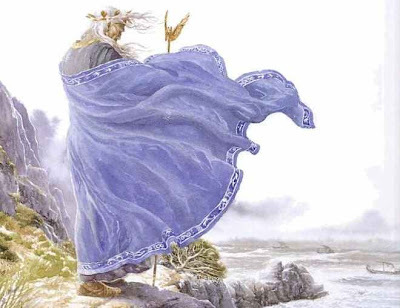 Alan Lee is probably best known for his illustrations of J. R. R. Tolkien’s Lord of the Rings and for his subsequent work as a concept artist on the film adaptations of these novels, but he has worked on many different books and films, though consistently in the genres of the fairytale or ancient mythology. 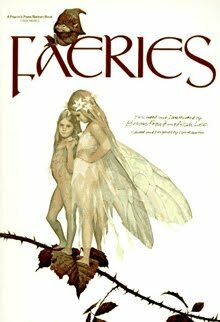 Faeries, which he illustrated with Brian Froud, was one of the books that I happened to pick up from the library of my friend’s father the other day, and I also remember his art from some of the Rosemary Sutcliff books that were a staple of my reading for several years in my early teens. He has a lightness of touch that usually manages to navigate between the two extremes that make most fantasy illustrators so horrible, falling neither into overly-dainty fairy cuteness nor into overly-heroic sword-and-sorcery stereotype. The Moon’s Revenge is an example of both the author and the artist at their best. The story follows the simple yet inexplicable logic that characterizes all good fairytales, where wishes can be obtained by throwing seven shoes at the moon, but only at the cost of the moon’s wrath and of seven barefoot years and of a sister who cannot speak and of a terrible danger that will threaten the whole town. The pace of the story is impeccable. It does not hurry, making time for the little complexities of the fairytale, but it swells to its climax with a grand inevitability. It is very good storytelling. The illustrations, fortunately, are equal to the story, as too few are. Lee’s watercolours lend the images a softness and a mysteriousness that is well suited to the subject, but his consistently dark and natural colours, heavy blues and greens and greys, continually suggest the sea and the mist of the seashore, and they ensure that the detailed watercolours do not become mere pastel prettiness. The effect is wonderful, and the work is easily as good as anything that Lee has done in his many grander projects since. Suffice it to say that I am now officially scouring the local bookshops for a copy of my own. Just read your wonderful blog on this fabulous book. I first found this wonderful book in about 1989, and when reading it before purchase it gave me goosebumps up my spine. I love this book and have read it often to my classes over the years. I hope you find a copy of your own to keep.